Actor Mark Ruffalo screened a documentary, and all it got him was a lousy place on a United States terror alert watchlist. Mark Ruffalo is the newest Bruce Banner, set to play the man you don't want to make angry in The Avengers. 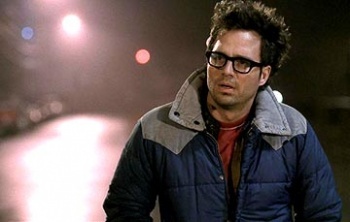 Ruffalo (Shutter Island, The Kids Are All Right, Zodiac) is now being considered dangerous in a very different light. The actor arranged screenings of the documentary GasLand, and spoke out against the natural gas drilling depicted in the film. His efforts as activist have yielded a surprising result: Ruffalo has been placed on a United States terror alert watchlist. GasLand was screened at the 2010 Sundance Film Festival, and details the process of hydraulic drilling for natural gas, or "fracking," in the rural United States. The documentary is billed under the tagline "Can you light your water on fire?" The Pennsylvania Office of Homeland Security doesn't seem to have an issue with drilling for natural gas, but they do take umbrage with Ruffalo raising awareness of the practice, and jotted him down on a list of potential terrorists. Here are the Pennsylvania OHS terrorism FAQs, which explain terrorism and suspicious activity. "Supporting a Sundance Special Jury Prize-winning documentary" doesn't seem to be on the list, but maybe threats are open to interpretation. On Ruffalo's being considered a genuine threat, the San Francisco Chronicle quotes him as regarding the whole thing as "pretty f**kin' funny." Either Ruffalo was misinformed, or he's full of it. Entertainment Weekly schooled the whole internet, reporting "a spokesperson for the Pennsylvania Office of Homeland Security denied that the actor had ever been included on any list, or that any such list existed. A call to Ruffalo's representative requesting comment or clarification was not immediately returned." Thanks to dududf for the tip.